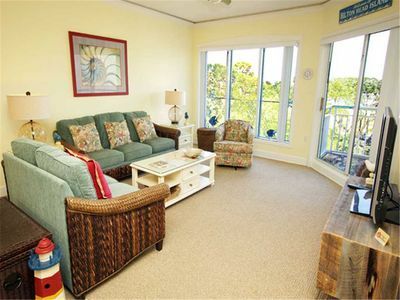 Our HHI #AR416 “Ocean1” 2BR/2BA condo sleeps 6. Owner requires 3 weeks min. prior notice before your stay & booking online due to 2 mailings and payment clearing our bank. We live 4 hours away and can not meet you at check in. All VRBO inquiries and online Reservations must now go through VRBO.com. 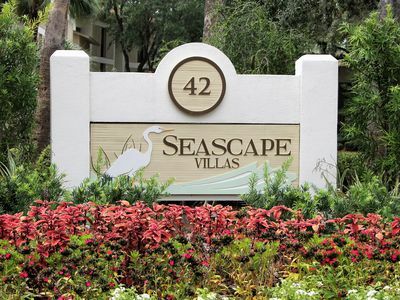 Sat to Sat weekly rentals only or 3-night min between a Sat to Sat from Oct. - Feb. Monthly rentals from Oct - March add $500 refundable security monthly deposit to quote & paid to owner. All rentals must sign owner vacation rental form with your info and ours on it before we mail you keys and parking passes, all. No check in as all is mailed to you. 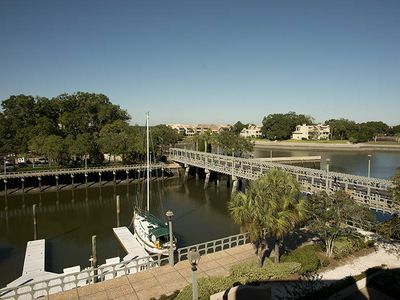 Our AR416 condo has Spectacular views & great location! Condo is no smoking & no pets, 6 people max. 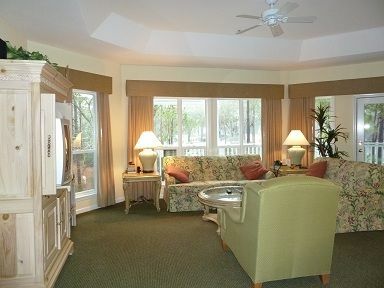 New free Internet WiFi (100Mbps) in our AR416 condo and entire Resort! 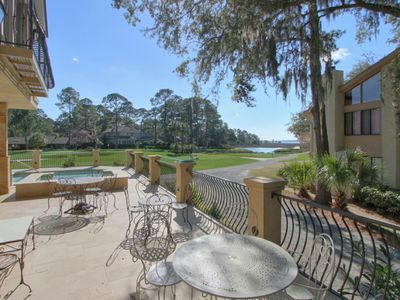 Our HHI 'Ocean1' angled oceanfront (Oceanview) 2BR/2BA condo has spectacular oceanfront views & was our first rental home purchased in 1994. 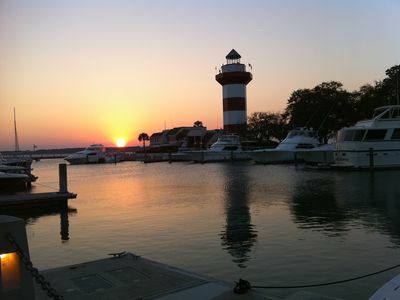 Condo sleeps 6, recently upgraded & is located at the HHI Beach and Tennis Resort, oceanfront Admirals Row Bldg. A at 416 Wallace Ladd Road. 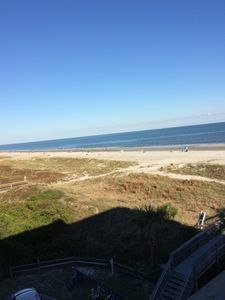 Condo is on the top floor (4) with a spectacular panoramic penthouse view of the beach, ocean and Olympic size pool and Tiki Bar from both the balcony and inside the condo. 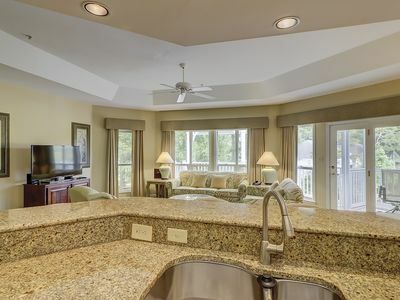 This upgraded condo has two bedrooms and sleeps 6. 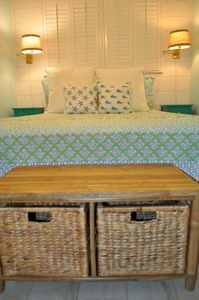 The master bedroom has a new pencil post bed, new queen-size mattress with an adjoining full upgraded baths. 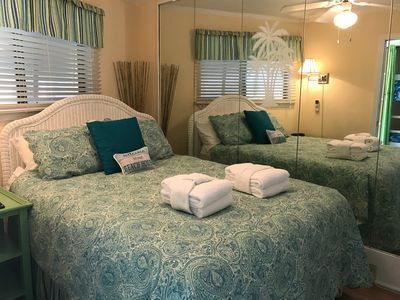 The 2nd bedroom has two new twin beds with a second full upgraded bath located down the hall. There are now 3 new HDTVs in den and both bedrooms, DVD/CD player, armoire, sleeper sofa (double bed) and smaller couch, as well as, 2 chairs in the den. 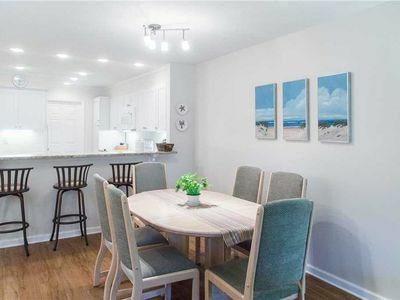 The condo is upgraded every year, 1000 s.f., fully furnished with a fully equipped kitchen, dishwasher, flat top range/oven, new refrigerator, new microwave, new central air system in 1/16, wet bar, & spectacular views of the beach and ocean! New water heater and appliances and upgraded baths. 2 New upgraded baths with new sinks, plumbing, vanities, mirrors and lights! New outdoor carpet on balcony installed. If you want to use the small gym or play tennis for free, the tennis pro shop is located about 5 min. Walk from our condo! 2-min. Walk to either 2 pools on-site. 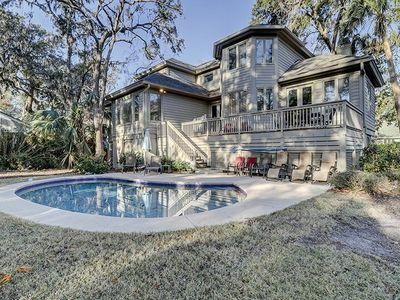 Largest Olympic size oceanfront pool and Tiki Bar on HHI! New coin operated washers and dryers are located behind the elevator on the 2-4 floors. * An Olympic size pool in front of the balcony, and a regular size pool behind Admirals Row Building * There is a Tiki beach bar and sports bar in the convention center. 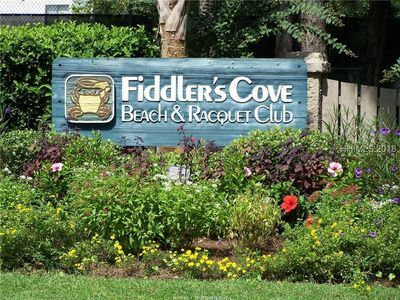 * Beach chair and bike rentals and biking paths are available at the resort. * There are 10 tennis courts on the resort, tennis pro and tennis shop. Tennis tournaments, instruction and information are available. * There are video rentals, convenience store, playground (near pond) and children activities planned at the main office of the resort. 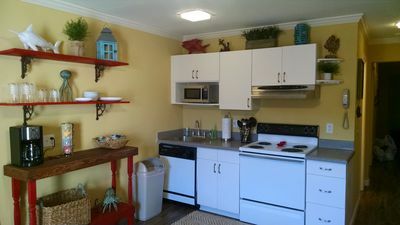 Condo has a fully equipped kitchen with utensils, plates, glasses, new microwave, new refrigerator, new range/oven, new dishwasher, new sink faucet, wet bar, blender, coffee pot, etc. 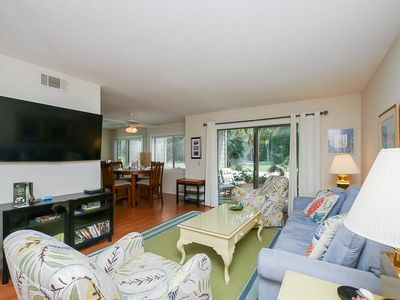 * The condo is fully furnished, including new refrigerator, new decor, new sleeper sofa (double bed), new couch and recliner, new master bed, new twin beds, new water heater, new tv cable, free WiFi, local calling only phone and new central air system. Condo is cleaned professionally before and after your stay. Clean linens and towels are provided. Rate includes all: Discount, All taxes, fees, utilities, clean linens and towels, and condo is pro cleaned before and after your stay! Renter must be: single married family (1-2 max. ), no pets, no smoking, no groups, over age 22, max. of 6 people. 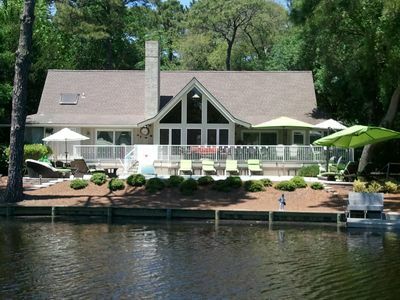 Weekly Vacation rentals only from Sat to Sat from April - Sept.
We are also professionals & licensed with the NCDOR, Dare Co., SCDOR, City of Myrtle Beach, Town of HHI & Horry County. We appreciate your business! Thanks so much! 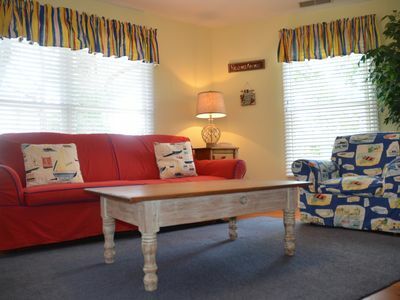 Our private rental homes have deep discounts and are upgraded yearly. We appreciate your valuable business! 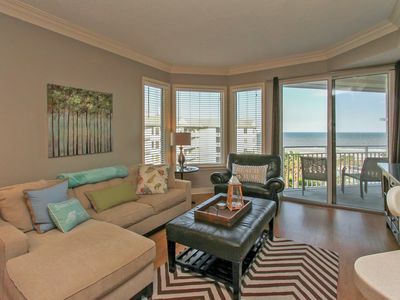 1504 SeaCrest - 5th Floor Oceanfront & Renovated. Stunning Views. 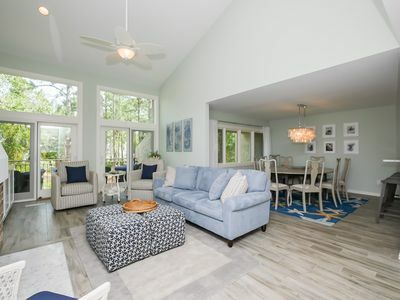 1464 Sound Villa - Fully Renovated - Gorgeous views of the Calibogue Sound! 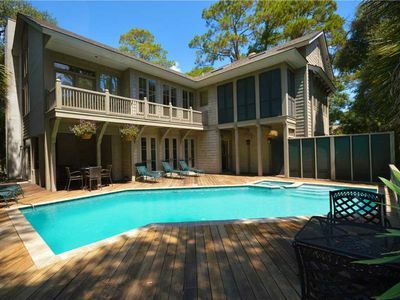 Designer furnishing, expansive private pool area, and large private deck!